The Cree XM-L T6 LED scuba diving light is cheaper than HID lights, more durable and uses a fraction of the battery power, it combines good price, amazing battery life to make a great choice as a primary dive light. The torch has Cree XM-L T6 LED with a maximum output of 1200 lumens which will penetrate 50 meters into the deep. It’s has a tough rubberized headband so it can be worn on your head leaving both hands free for exploring and with a rugged build and IP68 waterproof rating to a depth of 60 meters its suitable for both professional divers or beginners. It has a large toggle especially designed for use below the surface allowing the wearer to easily switch between the three modes of full brightness, average brightness and emergency strobe. 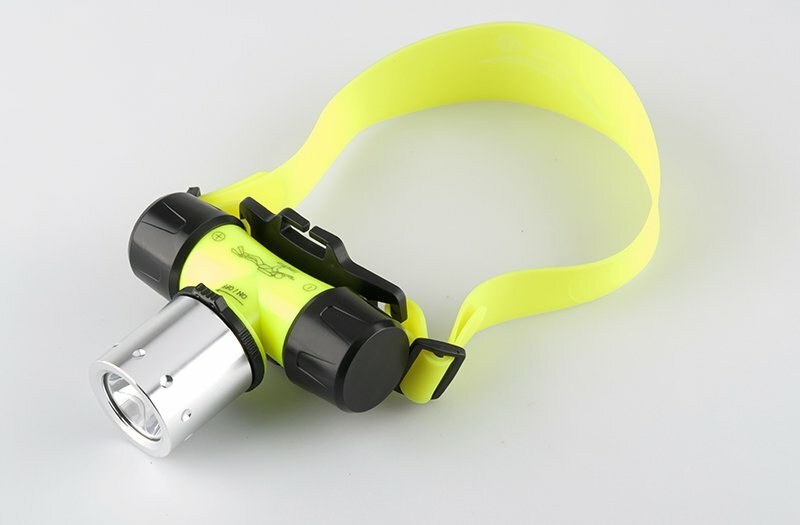 While specifically designed for diving this head torch works just as well on dry land and is suitable for camping, hiking, reading, night fishing, sailing, caving, hunting and just about anything else where a good light source is required.